The father of Mangku Widia was also a great leader but unfortunately he passed away in the middle of the 1960’s when Mangku Widia, his only son, was still young. Due to this loss — a loss of transmission of the traditional knowledge — Mangku Widia has tried all his life to learn from other sources such as the scholars who have worked in Tenganan. I met Mangku Widia on my first visit to Tenganan in 1979. There were very few tourists then — the walled village had only been open to the outside world since the 1960s — and I did not know who he was. He was just the most commanding presence in a group of handsome young men in traditional dress. “Mangku Widia was born in 1948, into the sanghyang clan. 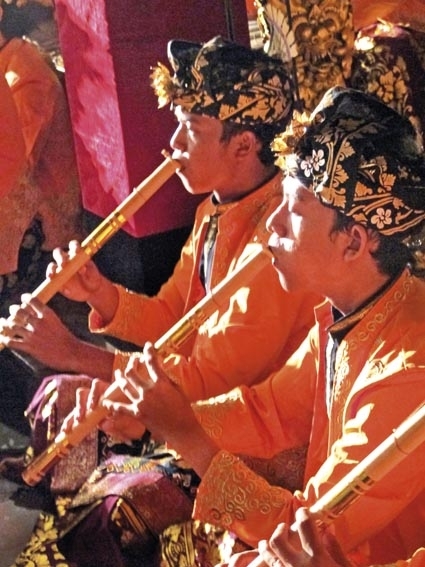 The sanghyang is the only clan which can provides priests (mangku) to the village community. In 1973, Mangku was also the main informant and friend of Shinobu Yoshimoto, the textiles specialist from the National Museum of Ethnology, Osaka, Japan who has published a lot about geringsing, the double ikat textile made only in Tenganan. In 1976/77, I did fieldwork in Tenganan. Together with Mangku Widia, I made a genealogical data bank on the population of Tenganan. We were able to reconstitute the genealogy of every inhabitant for a minimum of five generations. In 1978, I made, with the help of Mangku and my team, a complete medical and genetic survey of the inhabitants of Tenganan. The most interesting result for Mangku, was the presence of a genetic marker linked to India in his own blood and in the blood of a dozen of other individuals who all have a common ancestor with Mangku in the sanghyang clan. It was a confirmation that the founder of this religious community had a link with India which was not a surprise because the religion of Tenganan is an archaic form of Hinduism which precedes the classical Balinese Hinduism. In Tenganan, they worship Indra (no presence of the Trimurti, three primary Gods Brahma, Vishnu, Siva) and they don’t practice cremation. The temple of origin in every compound is in the direction of the sea not the volcano. Note also that dead corpses are buried naked, face to the earth and head in the direction of the sea. During the 1980s, until his last years, Mangku helped dozen of scholars, photographers, curators, official visitors, architects. 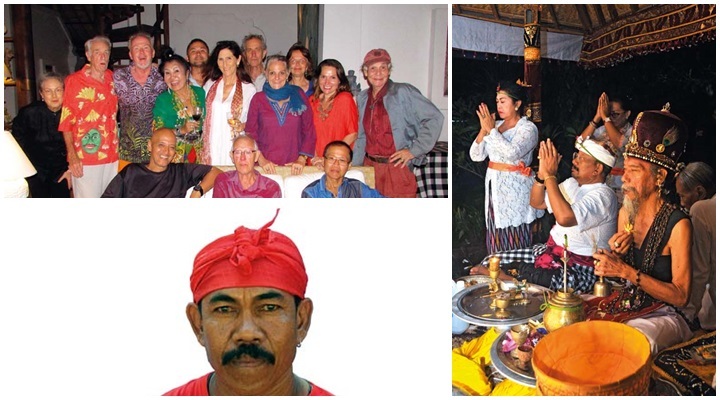 Thanks to him Tenganan became the most visited traditional village in Bali. ‘Killer snake loose in Bali’ the headlines scream. It transpires that a hapless security guard at the Bali Hyatt — the hotel now closed for 2 years for renovations — has been killed by a large python that the guard was man-handling. People in Sydney are talking about nothing else. And this horror story hard on the news about the mother and daughter dying after a fish meal at Padang Bai. Soon there will be television series called CSI Bali. Talking of television: While watching a popular Australia comedy series called J’amei, I hear a distraught father threatening his errant daughter with “No Schoolies in Bali”. It seems that the annual teenage debauchery once confined to Australia’s Gold Coast is now a solid feature of Bali’s Paradise myth. What next? A program on the water quality in Kuta called Asia’s Biggest Floaters? Turns out that the man-killing python at the Bali Hyatt is the duwe, a temple’s spiritual mascot. The Javanese victim was showing off with the snake — he is a well-known pawang lelipi (snake charmer). The Balinese had warned him not to tamper with the sacred snake. Tragic death in Mertasari just around the corner earlier: a huge branch of a Suwar ( Monkey Pod) tree broke off and fell on a carload of pilgrims returning from a spiritual cleansing wash (melukat) at Dalem Pengembak temple, killing a grandmother. It’s Kajeng Kliwon, the spooky and bad luck day, so a large ngulapin ceremony to release the soul at place of demise will have to take place. The family of my ersatz daughter-in-law the exquisite Dayu Pon, have spent the last month and all their money rampaging artfully through every temple, holy spring, major thoroughfare in their large traditional village. They have also worn every plausible high Balinese costume to celebrate another generation of ancestor worship in their family house temple. Their family house temple, which is of the merajan agung type, is fairly special as it houses a Barong (usually housed in village temples) and consort witch, Rangda. Outside the merajan is a Prajapati temple where villagers come to ask for magic holy water. Today I am invited to take part in a procession from the geria (palace) to the Pura Desa village temple nearby. I have a new vaguely Mod-Pop white waist cloth recently purchased in India for the occasion. 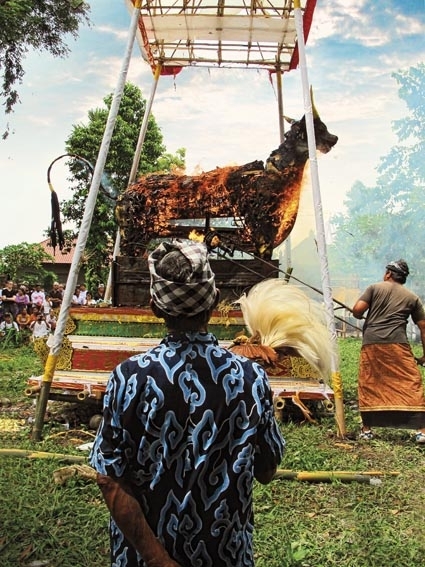 It’s very hard keeping up with the Brahmans in fashion-conscious Bali. The climax of the one month-long series of ceremonies was on the 15th of January when I was away, so I’m putting in an appearance at one of the numerous ‘encores’. I arrive at the family temple at noon to find a very calm and collected scene. The pre-entrance court, which abuts the main road, is a riot of leaf decoration; the temple court inside is packed with tiers of offerings and villagers praying. The family grandmother, High Priestess Ratu Niniang is leading the prayers. Deeper inside the compound I find a courtyard full of grandchildren climbing into classical Balinese dress in preparation for the procession; the house patriarch high priest Pedanda Gede Sibang and his wife, are busy-bodying around, their infectious smiles lighting up the scene. At the centre of all the activity are a pair of transsexual make-up artists from North Bali, grooming pretty pre-teens. I am so transfixed by this — tableau vivant — only the brushes of the drag queens are moving and miss the Barong’s procession down the hill to the village temple. I motor down the hill where both courts of the large Pura Desa are tightly packed with devotees. A Topeng Sidakarya dance is in progress where a high priest is intoning Vedic chants. At 2 p.m. everyone prayers in the outer courtyard before processing off in a glamorous defilé, Barong and Rangda taking up the rear. 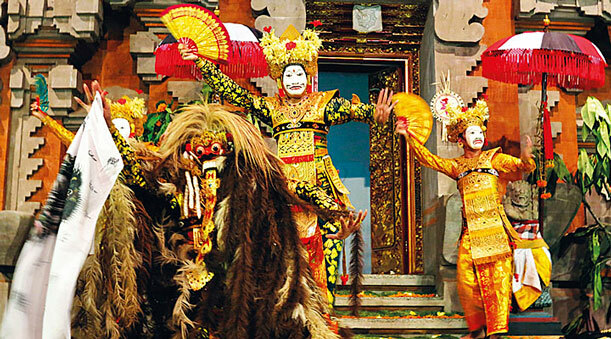 It is a display of extreme refined Balinese beauty: the grandchildren in gilt crowns, the marching gamelan, the temple setting with giant banyan tree. I get all emotional every time I see such displays of aesthetic strength: I am always thrilled that the Balinese culture survives in its original, effortless form. See video: http://youtu.be/HtJec691XKI for further confirmation.